Read Part I introducing Thanos. As I mentioned last time, Jim Starlin’s original Thanos saga ran over the course of eight issues of Captain Marvel published bi-monthly, so it took sixteen months of real time to play itself out. I should also mention that several other titles loosely tied in with the saga, including the aforementioned Iron Man, Avengers, Marvel Feature, and, of all things, Daredevil. Full disclosure here: These comics were originally published a bit before my time. (Hey, I may be old, but I’m not ancient!) So I didn’t have to endure the excruciating sixteen-month wait for it to finally conclude. Still, I had to find back issues at a time before the dawn of the comics specialty shop, and I figure my “comics quest” might be of historical interest to some of you (and a trip down memory lane for others). I first came across an old copy of Captain Marvel #27 in my barber shop when I was six or seven and the barber let me have it. It was already a couple years old and badly beaten up, the cover barely attached (and falling off completely within a week or two of taking it home). A couple years later, a New Jersey comics dealer called Quality Comics opened a booth at a local flea market. They had a full complement of Captain Marvel back issues, but the Starlin ones were three bucks a pop. Believe it or not, this was a lot to pay for a comic book at the time. (For perspective, the cover price of a new comic back then was forty cents.) So I could only afford to buy one issue a week. And that’s how I experienced issues 28 through 33, one week at a time, over the course of six weeks—not unlike the old 1940s movie serials Grandpa told me about that used to run one chapter per week over the course of a couple months. I must say it made for a rather rich and dramatic reading experience. As previously noted, this epic was something new in comics. 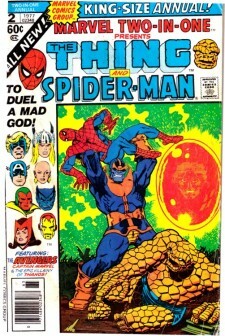 In addition to its extended length, as well as the fact that it may very well have been Marvel’s first major crossover event, the saga was “trippy” in a very 1970s way. We saw Thanos engage his nemesis Drax the Destroyer in a battle of “Time-Mind-Sync-Warp,” with appropriate psychedelic rendering from Starlin. We saw Captain Marvel interact with Ego, a jellyfish-type being, with a giant eye on one side of his head and Captain Marvel’s masked face on the other. This interaction led to the Captain becoming “cosmically aware”—a state achieved only after the Captain literally fought (and destroyed) himself. What did it mean to be “cosmically aware”? Starlin never comes right out and explains it, but if you read the comics you’ll likely end up with some appropriately vague notion. More broadly, this whole arc was just dark as all hell. Death was absolutely pervasive and inescapable throughout. This stood in almost direct opposition to Stan Lee’s very positive, humanist philosophy that had previously defined the Marvel line. Starlin was different from Lee, from a different generation with a very different viewpoint. As an artist, he was a total original—and Thanos was equally unique. Other classic Marvel villains tended to be tragic (Dr. Doom) or just plain evil (the Red Skull). Even the godlike Galactus had a fairly primal motive (hunger) and thus could be understood. Thanos, however, was beyond mortal ken. There could be no understanding him or his nihilist philosophy, and this only served to make him all the more terrifying. Another thing that makes Thanos so terrifying: He just keeps winning. Over the course of nine issues (ten if you include his first appearance in Iron Man #55) and nearly a year and a half of real time in this initial arc, he consistently outsmarts nearly all his opponents. When he doesn’t outsmart them, he simply overpowers them—at times with ridiculous ease—over and over and over again. While Marvel fans were used to seeing their heroes suffer setbacks, they never had to watch them take a beating like this. At some point you actually begin to question how the good guys can ever possibly come out on top. By the end, it didn’t feel like the heroes won so much as they simply survived. Prior to this, every notable Marvel character was either a Lee-Kirby/Lee-Ditko creation, or otherwise felt like one. Thanos, however, was all Starlin. And even though he was nothing like any of the previous, classic Marvel characters, Thanos stood up alongside the best of them—equally grand, equally memorable. But he was most definitely not of the Silver Age. He was of the Bronze Age: a figure of staggering stature in this new era of comics. Many comic historians mark the end of the Silver Age (and the beginning of the Bronze) with the death of Gwen Stacy in Amazing Spider-Man #121 (cover date June 1973). One could make the case that the introduction of Thanos in Iron Man #55 (February 1973) would mark this transition even better. In any case, 1973 was clearly the year that Marvel turned dark. Starlin left Captain Marvel after just one more issue and would turn up again a few months later directing the adventures of another cosmic character, Warlock— first in Strange Tales #178–181 (Feb.–Aug. 1975) and then in a revival of Warlock’s own title in Warlock #9–15 (Oct. 1975–Nov. 1976). As trippy as his Captain Marvel work was, Starlin’s Warlock was even wilder. (The details are so complex and awe-inspiring that they beg for their own separate column at a later date.) Of course, this work included the re-introduction of Thanos in what was supposed to be another epic. Unfortunately, the title was prematurely cancelled, leaving Starlin to tie up the loose ends in Avengers Annual #7 and Marvel Two-in-One Annual #2, both released in the summer of 1977. It’s the “of course” part that gets me. 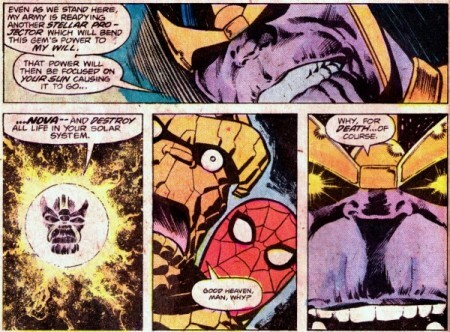 It all makes such perfect sense to Thanos, so much so that he cannot fathom how anyone else could fail to understand. But of course, no one can ever understand. Thanos is on a level all his own, and there’s no one else in existence that can begin to understand him or relate to him. And this is precisely where Thanos Rising goes wrong. Come back in two weeks for the conclusion, exploring Marvel’s current miniseries, Thanos Rising.